Damn The Contradictions! Giving Feels Good. 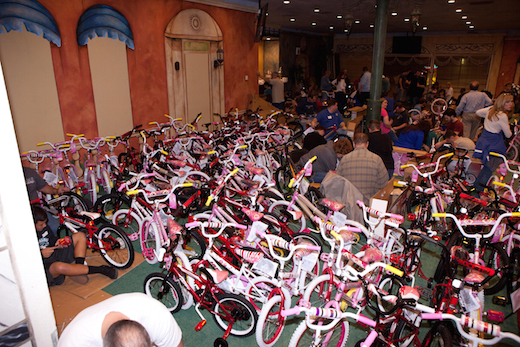 Last night my Rotary Club of Simi Sunrise led a community effort to assemble the bicycles we had raised money for and purchased to distribute to children in our community whose families could not otherwise afford to get them one this year. We planned on buying, assembling, and distributing 300 bikes, but were only able to get 272, because there just weren’t any more available. A sample of the 272 bicycles assembled for community gifting. Above is a pic showing some of these bikes. They were all assembled, put through a final quality check to ensure everything was done correctly, and loaded into trucks for distribution to the various groups and agencies who were participating in this event in approximately 2.5 hours. Kudos to everyone involved. It really was an amazing event, topped off by free pizza from The Junkyard, which was delicious. PS – The title I used for this post reflects my knowledge that things like philanthropy and volunteerism (especially the former) can be indications of a failure in our society to meet the basic needs of many of our citizens. While I recognize there is, indeed, a problem of economic justice inherent in the ways we distribute goods and services, I also recognize there remains a real need regardless of the theories and concepts we can develop to describe and explain them. I therefore wish to opt for doing what I can (and Rotary seems an excellent avenue with which to do it) to alleviate some of the discomfort caused by the imbalance. A couple of years ago, in response to a request from the Simi Valley Chamber of Commerce, I conducted (as I recall) twice-monthly seminars on the use of social media for small businesses. They were called “Facebook Fridays” and you’ll never guess what day of the week we held them on. They started out as presentations on various aspects of the technology and the philosophy behind their use. However, after a short while it became clear that people had lots of specific questions they wanted answered. In response, I changed the nature of what I did and started each session off by opening it up to questions. It worked quite well for nearly a year but, toward the end, attendance dwindled and I grew somewhat weary of doing the necessary preparation and having to show up twice a month. The Chamber found someone else willing to continue the work and I moved on. By that time I was becoming disenchanted with the direction I had chosen to attempt building a useful business and was looking to other areas of endeavor as well. Recently, I had lunch with the CEO of the Chamber and we decided it would be useful for me to bring back what I had done before, the difference being the subject matter would be a little less focused on marketing and a lot more focused on business model, business process, technology, and cultural transformation. Today was the first of what I hope will be many such events. I used a vehicle I have not used before to conduct this 50 minute webinar – Google Hangouts on Air. I’m not sure it’s the best way to conduct something like this, but viewership is unlimited and the session is both recorded and automatically placed on my YouTube Channel. I’m embedding the session below. This really was somewhat of an experiment and the subject was quite broad. I’d love to get some feedback. Don’t be shy now. It’s been nearly three years since I “retired” from Pratt & Whitney Rocketdyne. I’ve been through several iterations of “What do I want to be when I grow up” and I think my latest incarnation is actually working! I’ve given myself until the end of this year for it to prove out to be a viable trajectory, at least for a few more years while I still have to tend closely to my children. You can read my most recent self-assessment/self-promotion at LinkedIn. Additionally, some of the seeds I planted a while back may be sprouting, which would be really satisfying and might steer me comfortably toward another line of work I can enjoy. It’s important to note there are lots of large organizations who recognize the value of social for reaching out to, and communicating with, their current and potential customers. There are fewer, in my estimation (disclosure: I have not researched the numbers. I have, however, been observing for a long time) that appreciate the value of social to build community inside the firewall, let alone in the space they share with their suppliers/vendors. At any rate, I haven’t given up entirely and I was gratified to be contacted by someone who interviewed me on the subject nearly 2 years ago. He asked if the audio could be used in a couple other blogs and sent me a link to it. Frankly, I had completely forgottenI did the interview. Also, inasmuch as I am now doing some editing/proofreading professionally, I was a tad dismayed to read the copy that accompanied it, and I’ve asked for the opportunity to proofread these new publications prior to publication. I don’t believe I had that opportunity with the first publication, which can be found here. Below is the Vimeo audio file with my interview. I don’t think I made a fool of myself. I’m hoping I actually make more sense today than I did back then. I’m gratified Dustin felt it was worthy of being repeated. PS – I may no longer be a Chief BooMillennial Officer, but I do think I’m still an Emergineer and definitely a Serendipity Wrangler. The title for this post comes from a session my friend, Trisha Liu, has proposed for this June’s Enterprise 2.0 Conference in Boston, MA. I came across it the other day quite serendipitously while checking a few Twitter streams on my iPad as I waited for my car to be washed. The title caught me eye immediately as anyone who knows me will understand, especially when read in its entirety, viz “Occupy Communities: Social Media Training for the 99%”. If you have a moment please visit the page and, if you agree it’s a great idea, leave a comment saying so. 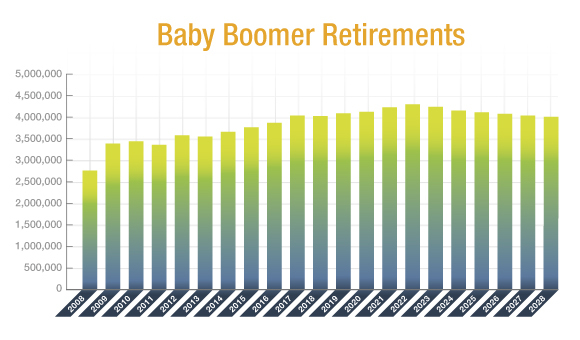 A friend told me recently he’s been hearing more and more concern from large organizations about the upcoming wave of retirements from my generation – Baby Boomers. He is not alone. A decade ago, when I first started doing Knowledge Management work for Rocketdyne, one of the most important issues we wanted to address was the looming wave of Boomers who would be reaching retirement age and the threat that posed for the collective knowledge of our organization. As a company that designed, manufactured, tested, and flew the world’s most sophisticated rocket engines (including the Atlas, Delta, and Space Shuttle Main Engines), each of which had long histories and service lives (as systems, not as individual units), continuity of our knowledge was of paramount importance. Those of us who were actively pursuing KM were very concerned we would fall below a critical level of skill and jeopardize the safety of the Astronauts who flew the Space Shuttle. Unfortunately, although lots of lip service was paid to the “looming” problem – as well as a lot of time and money likely heading off (in retrospect) in the wrong direction, turning that massive ship around was virtually impossible. Now that the program is over and there was nothing already in the pipeline to replace it, my alma mater is bleeding talent on a regular basis. I suspect there are lots of organizations facing this “crisis” as well. I’d love to be able to help them out . . . and here’s my business model (at least a portion of it; I’ve other things in the works as well). With the growing number of Baby Boomers set to retire – or even partially retire (like I have) – and not reaching a crescendo for another decade, the issue we once dealt with as a Knowledge Management problem I now believe is one of acceptance of social media inside the firewall, i.e. the development and use of communities, facilitated by tools and leaders trained in their use as a knowledge transfer process. We spent many years finding and categorizing hard-copy and digital media. We’ve spent countless hours and dollars on exit interviews and video recording of retiring employees. All the time we kept saying tacit knowledge (the knowledge people carry around in their heads) was something like 80% of the actionable and useful knowledge possessed by an organization. I have argued for some time that social media IS the new knowledge management. Although it’s now a bit old, I have a presentation on SlideShare I originally prepared for my cohort at CSUN‘s Tseng College, shortly after I finished a Masters program in KM. Sadly, though not surprisingly, the program no longer exists. I believe this is partly because they failed to recognize the power of social media to do what KM really needed to do. As practiced, in my experience KM was far more like Library Science. What is happening now is a sea change, a phase shift that employs technology capable of connecting people in real-time, while also providing a level of archival, indexing, and search capability that allows for historical knowledge discovery as well. However, I’ve also experienced a high level of resistance to accepting what I consider to be inevitable. I can only speak for the aerospace industry, but I struggled to implement social business capabilities for nearly a decade and, as far as I can tell, my former organization is still fairly resistant to the possibilities it provides. This is the issue I believe others are encountering as well, and it is what Trisha’s presentation is all about. A more specific interest of mine is in gaining acceptance from the group of people who will be retiring within the next decade or so. I believe it’s important to engage older, soon-to-be retiring employees in the use of social business tools, not to “pick” their brains, but to provide a forum for interaction with their younger employees, within the tool (embedded within the processes they are currently employing, if possible), so their knowledge can be slowly transferred to those who will follow in their footsteps. As a Baby Boomer who is entirely comfortable with the use of these kinds of tools and the behaviors that must exist in order for them to be effective, I believe I have a unique perspective to offer organizations who wish to engage their “more mature” employees. Many of them think they are incapable of understanding them or that you have to be young to employ them. Worse still, many have been influenced by the media’s depiction of tools like Twitter, Facebook, and YouTube such that they are currently incapable of seeing the value in micro-blogging, status posting, and video sharing to an organization’s ability to improve how they get things done. I – and, I’m sure, many others like me – can reach these employees far more easily than their younger colleagues, if only because we have the same generational backgrounds and have (or have dealt with) similar fears and anxiety. This is why I believe Trisha’s presentation is important. It may not address the more sophisticated aspects many in the Enterprise 2.0 (or Social Business, whatever we wish to call it) world are concerned with as they mature and evolve their theory and practice, but it does directly address what I believe is a core issue with the effective use of these tools in our various organizations. Without acceptance, I am convinced the tools and practices that facilitate the sharing and use of “The Corporate Memory” will remain on the periphery of the enterprise and likely chew up more time and money than they’re worth and, in doing so, become more of an anchor than a sail. My goal here is not to delve too deeply into the many nuances of this issue – e.g. Tacit vs. Explicit knowledge, cultural change, the role of Executive leadership, etc. I will save that for further posts. However, I do think acceptance is a huge millstone hanging from the neck of many an organization. Am I too pessimistic? What do you think? I recently was pointed to a wonderful TED Talk, which I’m sharing here, that brilliantly addresses an issue I have struggled with for years. This issue can best be understood in several concepts that Alain discusses in this talk, which I’ll leave you to in a moment. 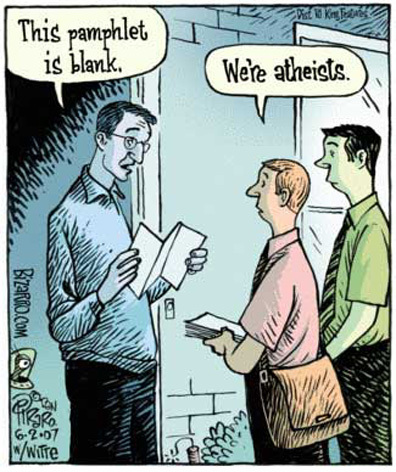 I’ll come back to this, and other, issues regarding faith, religion, morality, ethics, community, etc. in later posts no doubt. I have what I think is a very simple, very open attitude toward religion or, more accurately (because religion is an entirely different animal from . . .), faith and how we should exercise it ourselves and respect it in others. What you believe in terms of a higher power is really none of my business and should in no way affect my relationship with you. It seems to me that how we live our lives, not what we say we believe or have faith in, is the most important discriminator in how well we can work together in pursuit of common goals. The only thing that can botch any chance of our having a relationship is if you insist that your belief is superior and, therefore, I must accept it to be truly worthy. Pull that on me and I become stone deaf. A respected Law Professor of mine once said if he had to choose between someone without what he would consider the “right” politics, but who was nevertheless a good person, and one who had the “right” politics, but was lacking in the humanity department, he would always choose the former. I believe we can replace the word “politics” with “religion” and it is equally true. I am far more interested in how you treat other people and your relationships, whether business or personal, than I am in what you believe in. Getting back to the video, Alain addresses his concept of atheists better understanding the good things religion has inspired people to create and bringing into our lives. He points out how community, art, and music – among other things – are lacking amongst atheists – as a group; and I think he’s right. As a group, I believe ethics and rational morality play a big role in how we see the world. I often say that if the only thing making you a good person is your fear of being punished in an afterlife, you really need to think about your priorities. For me, being a good person and living an ethical, honest life is reward in and of itself. However, we have few ways (I have none) of enjoying community in how we view our place in the cosmos . . . because there aren’t any. I’ll let the video speak for itself. Check it out. It’s excellent on the subject. I plan on watching it again soon. Yesterday (February 14th) marked the nine-month anniversary of my leaving Pratt & Whitney Rocketdyne. In this time I have slowly transformed from an employee of a large, multi-national corporation to a self-employed entrepreneur. In so doing I have changed my mindset from that of a community member and manager, responsible for greasing the skids of social interaction amongst workers with similar goals, to that of a marketer, responsible for understanding how social creates a different kind of community amongst people with a symbiotic, but not so insular connection. I can’t remember where I read it, but I try to always keep in mind what someone said about marketing, which I can directly apply to my work – You can learn marketing, but you can’t be taught what is learned in over forty years of experience. So I’m busily studying marketing and, especially, how to utilize social media to provide a new level of engagement never before possible between a business and its customers. In making this change I have joined the local Chamber of Commerce and a business network. I have also, since I am old and experienced enough, volunteered my services to my local SCORE chapter. My knowledge of social media was in great demand and I ended up helping a few people out even before I was officially a member. As a result of my Chamber membership, I decided to do a little study of the restaurants in the Chamber and their use of four avenues often used for marketing and public relations, e.g. Foursquare, Yelp, Facebook, and Twitter. I looked at each channel a bit differently. For instance, for both Yelp and Foursquare I was most interested not in whether or not the business was listed or had either tips or reviews of it, but whether or not the businesses in question had claimed their venue so they would have some level of engagement available to them. What I discovered was surprising. I haven’t looked at all the other restaurants in the area. Nor have I considered bars, pubs, retail establishments that could benefit from the use of these four services (as well as other methods of marketing considered social, e.g. blogs), or professional services that could do the same. This does indicate to me a huge market for my services, although my experience tells me it will be a bit tough to crack, as these kinds of business owners are notoriously frugal and suspicious. Nevertheless, I think the clear direction is for greater and greater use of social media to market small business and, especially, to engage with customers in a transformation of how business relates to, and learns from, them. I think there’s a place for me and others like me to provide them with a bit of knowledge, some organizational help, and strategic direction. One thing’s for certain. I am really enjoying connecting with my business roots, as I was in small business for over two decades before joining Rocketdyne prior to my 40th birthday – much of it actually in the food business. As I gain experience and knowledge in my new field, I hope to share it here on my blog. Stay tuned! I have been a KM practitioner for over a decade, and one of the principal reasons we have given for using KM principles is the need to keep from reinventing the wheel. So, in that spirit, rather than write my impressions of the Enterprise 2.0 Black Belt Workshop here at the Enterprise 2.0 Conference in Boston, I’m merely going to point to the blog of my friend @VMaryAbraham, since she has taken copious notes and already put them online. This will make up for the fact that I accidentally set my alarm for 6:51 pm (most of my timepieces are set to 24 hr time) and got about an hour later than I had planned, coupled with a public transport nightmare, that had me over two hours late to today’s inaugural session. P.S. – unfortunately, WordPress does not fully support the iPad yet, and publishing a blog is a bit problematic. One problem; I can’t make the URL to Mary’s blog an actual hyperlink. I’ll have to fix that as soon as I have access to a regular computer. In the meantime, if you want to read Mary’s notes you’ll have to copy and paste the URL into your browser. Sorry about that.